Improve your Ruby on Rails ™ website's scalability and efficiency with Ruby Enterprise Edition. Ideal for VPS, high-traffic servers and shared hosts. Notice: Ruby Enterprise Edition has reached End of Life in 2012. The website is still up, and it still works, but it's no longer actively developed and it is no longer supported. 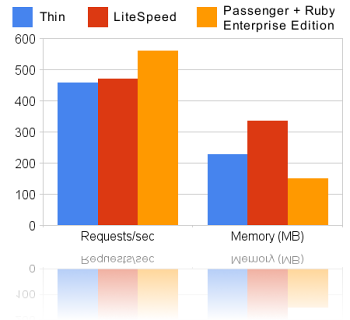 Allows your Ruby on Rails applications to use 33% less memory on average, when used in combination with Phusion Passenger. 100% compatible with the official Ruby interpreter, version 1.8.7. Easy to install, either via a native Linux package or via the included installer. Can be installed in parallel with regular Ruby. 100% self-contained, 0% installation risk! A copy-on-write friendly garbage collector. Phusion Passenger uses this, in combination with a technique called preforking, to reduce Ruby on Rails applications' memory usage by 33% on average. An improved memory allocator called tcmalloc, which improves performance quite a bit. The ability to dump stack traces for all running threads (caller_for_all_threads), making it easier for one to debug multithreaded Ruby web applications. I'm just interested in reducing memory usage. How do I use it? Make sure that you're using Phusion Passenger. Then follow the instructions on the Ruby Enterprise Edition download page. And that's it. It should be a completely drop-in and transparent experience. See the FAQ page if you want to know more about Ruby Enterprise Edition. Copyright © 2008-2012 Phusion™, unless explicitly stated otherwise. "Phusion" is a trademark of Hongli Lai & Ninh Bui.